The protagonists of the classic Disney Frozen arrive in their baby version for you to have fun giving the best care to the two princesses. Elsa and Anna were also small and will need the necessary care for a baby, so they will grow healthy and happy. The first will be Elsa and we will have to start preparing the bottle. We will have to mix the milk powder with the water and shake the bottle. When we finish it will be bath time and we will lather and rinse it so that it is clean. Finally, we are going to prepare a vegetable porridge for dinner. When you finish it will be Anna' s turn and we will have to follow almost the same steps as with her sister. Enjoy with Frozen and his princesses Elsa and Anna of babies. 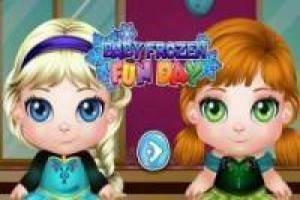 Enjoy the game Frozen: Elsa and Anna babies, it's free, it's one of our frozen games we've selected.